Another 2-ish AM wake up again. Tried for about an hour to go back to sleep. Tried something different. Ralph was sound asleep and facing away from me so I hoped my light wouldn’t disturb him. Turned the light on and read for about 20 minutes. I got really sleepy, outened the light and went back to sleep!! Woke up at my preferred time of 6AM. Ok by me! I need to try that from now on. I even have a little light that hangs around my neck. I could use that with less chance of waking Ralph. I may have found a way around this! Didn’t get to share a trip to Subway that Ralph and I took on Wednesday. They now have pepper cheese which I like and I have them toast the bun and the cheese. 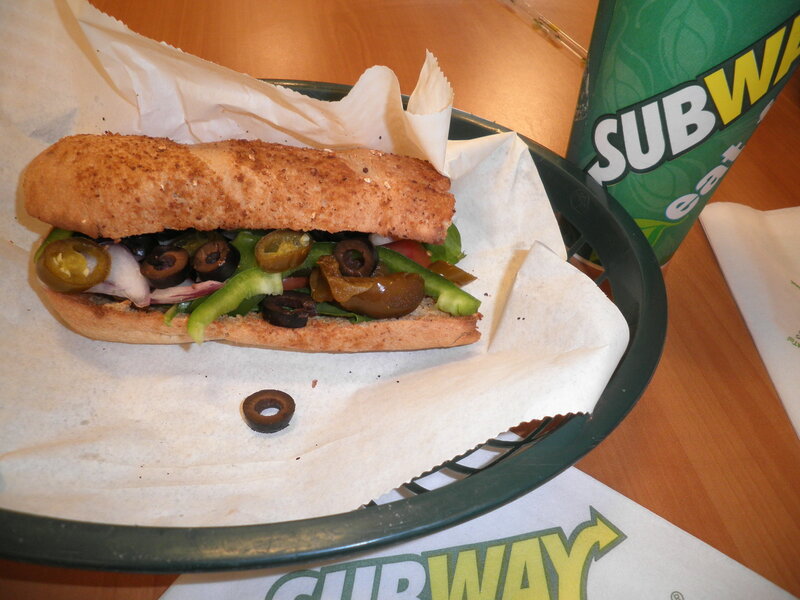 To that I add spinach, tomato, onion, sweet pepper, green pepper, jalapeno, black olives and southwest sauce. I’m still trying to replicate that sauce. It’s a mission. As much as love Subway, I’m becoming a little disappointed in them. They’re very reluctant to put much on the subs. I always have to ask them to put extra. 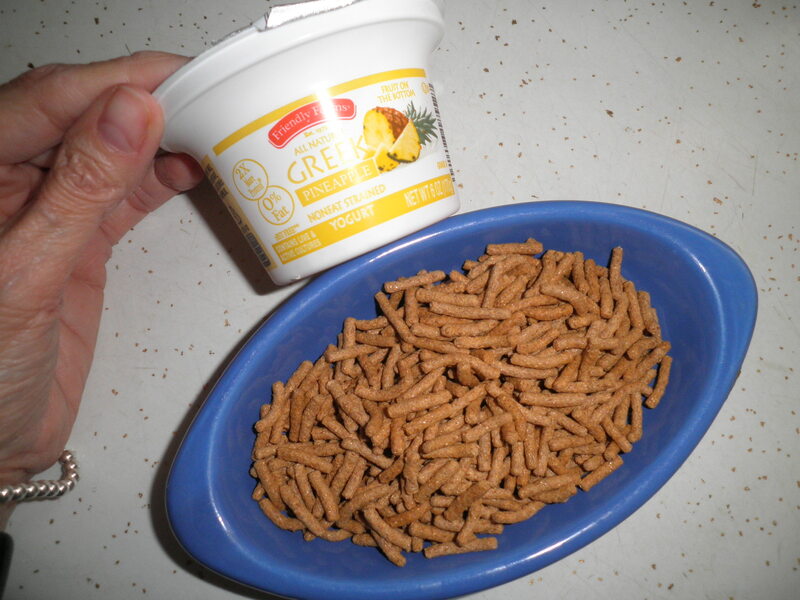 Yesterday’s breakfast was one of my favorites…Greek yogurt and Fiber one. The yogurt was pineapple this time, the Aldi variety. Yum… Cheaper and tasty! Ralph decided we need to go out for a late lunch, funny thing though…we both had breakfast! 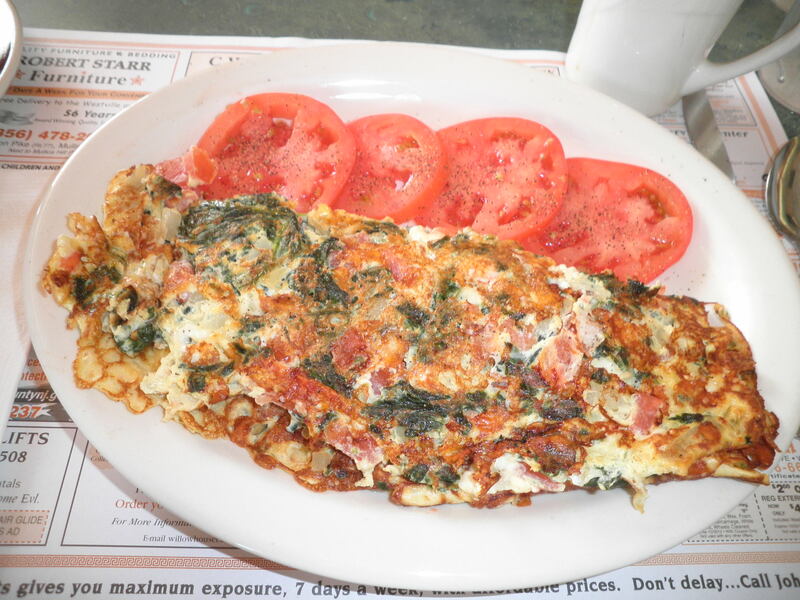 I had the Greek omelette…feta cheese, spinach, tomato and onion. Slice tomatoes on the side in place of home fries. So very tasty. The best part was that because we were there between 3pm and 5pm we were eligible for the Early Bird special and…we saved $5.00 off our bill! Excellent! I’ve got lots to do today and I’m so glad I was able to get back to sleep. I feel good and I think there will be at least one crock pot in my future today and I’m sure another over the weekend! Gotta cook those beans! This entry was posted in Uncategorized and tagged breakfast, veggies. Bookmark the permalink. That omelet looks delicious! I often order breakfast when we go out. I’m usually too rushed to make anything more substantial than cereal or toast at home, so I enjoy the more elaborate breakfasts I can get at restaurants. Dana, this diner makes excellent breakfasts and they are the most reasonable around. My cheap side is showing!! oh, that is good news that you were able to fall asleep again, fran! reading is what works for me if i can’t fall asleep! you need to come to canada and have a veggie burger at harvey’s: this fastfood chain prides itself on building your burger as you like it – you tell them how many tomatoes, pickles etc you want! Harvey’s sounds like the place for me, Cathy! I’d love to visit Canada. Seems like there are a lot of nice folks up there…Like you! Happy Friday! glad to hear that you got back to sleep. Woke up at about 3:30 myself, finally fell back to sleep around 5. It’s all good, though! It happens to everybody from time to time, but I’ve had more than my share lately! And I stopped bothering with subway for just that reason–especially the veggie subs, they’ll just give you a sprinkle of lettuce and maybe two slices of tomato on a giant bun if you aren’t there to keep saying “More. More. More.” I like their food, but it’s just too annoying! Boy, Allie, is it ever annoying. We don’t go often for that reason. Ugh, I wake up around 230 or 3 almost every other night. This is new for me over the past year. I hate it! Maybe I’ll try your trick. Usually I just lay their and hope to fall back asleep! Stacie, if I don’t do something it makes me crazy because my mind races with so many things. I usually get up and work on the computer. I was happy that a little reading did the trick for me. Hope you find something that works. BIG yay for the sleep!! Enjoy your Friday Fran!!!! “outened” <– my new favourite word! I hate middle of the night wakeups. They're really stressful…especially if I have to be up in the morning. Hi, Stephanie!!! I think “outened” is a Pennsylvania Dutch phrase. I’ve always thought it was a cool word. Gotta get this sleep thing worked out. I keep trying! so glad you found something to help you get back to sleep! i love falling asleep to a nice book. although, then i have to backtrack a few pages the next day to decipher my dreaming-reads. they have these thin little lights that just shine all across the page. a few people had them when i was in college. i can try to find them online to show you if you’d like. at subway, i always get two cheeses (and just plain vinegar, so i don’t even consider it being unhealthy), lots of veggies, and end with “a lot of lettuce, please? yes, that’s great. as much as you can fit on there.” 🙂 it used to work at wawa. they would laugh at me, but keep going.